Religious Education is a popular and academic discipline within the school. Following the guidelines laid down by the Islington Agreed Syllabus we have a multi-faith, concept driven approach and look at the belief systems of the six main world religions (Christianity, Islam, Judaism, Hinduism, Sikhism and Buddhism) in addition to atheist responses to philosophical questions. 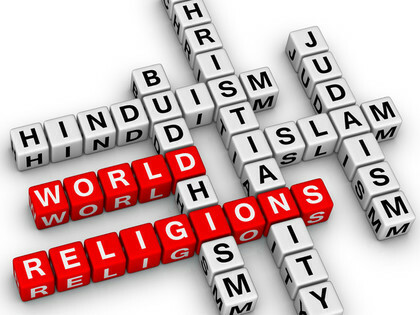 Pupils learn the basic beliefs of the 6 major world religions focusing on religious founders, holy books and expressions of faith in addition to addressing their own beliefs. Pupils learn how different religious beliefs impact people across the world. Topics such as women and religion, the afterlife, family life and world problems are addressed. All pupils in the school participate in the full course Religious Education GCSE. At GCSE all pupils study AQA Religious Studies Specification A; Themes and Religion (Islam and Christianity). Pupils are assessed by sitting two exams at the end of Year 10. There is no coursework and there are no tiers for the RE GCSE. Themes addressed in this course include; The Existence of God, Religion and Life, Religion Peace and Conflict, Crime and Punishment. The religions studied are Christianity and Islam. • the religious and cultural diversity of contemporary British society,and how such diversity enriches our national life. As well as enabling pupils to make informed and thoughtful personal responses, learning from experience and religion also enables them to engage with, analyse, interpret and critically evaluate the views of others, including religious believers. Through this critical thinking, pupils will learn to recognise that people see things in different ways, and respect the right of others to hold views that are different from their own. The EGA RE department encourages pupils to extend their learning outside the classroom. All students are issued with a textbook for the Philosophy GCSE. There are also many valuable resources on the school network that pupils can access. Some useful websites are listed below.